CLIMATE OUTLOUD 2017 EVENT Digital Toolkit – Feel free to share the photo and the event details. The following materials have been created to help cross-promote and share Climate Outloud. Who: Today’s Youth are Suing the Government to secure a livable future. What: Climate Outloud is Climate Fair with facilitated panel discussions. Hear what the youths and attorneys say about this case. It’s part of the KCLS “Everybody’s Talking about It” Series. Time: 11:00 AM – 4:00 PM. Why: This is the most important case of the century and we’re talking about it! Invite your friends. Come hear what the kids are doing to save the planet. When everybody’s talking about it we can make a difference. 3:45 – Event Survey – Thank you to Participants! Parking: Free KCLS parking lot, unlimited time. FLIER: Will be updated soon. 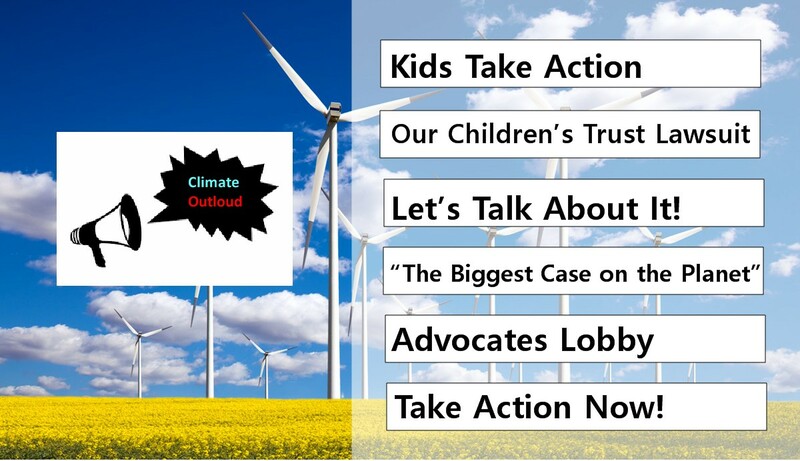 TWITTER: @ClimateOutloud HASHTAG: #ClimateOutloud Follow us, and we’ll follow you! We love to share and cross promote our community organizations and partners. Please join us, “Like” and share our Facebook page! http://www.facebook.com/ClimateOutloud . We will also “Like” your Facebook page, tag you, and share your page while promoting our event. KCLS “Everybody’s Talking about It” series is awesome! Let’s talk about climate change. http://www.facebook.com/ClimateOutloud Saturday, October 21st, 2017, Downtown Renton Library. Let’s tell everyone! The Climate Outloud event will happen again in 2018 as the case moves forward. Date to determined by KCLS. Volunteer: We still need volunteers, so please help us by asking your networks to help out! Presenters and Partners have a table in the conference room for their materials, fliers, brochures, etc. Produced by the Weed Warriors Nature Stewards Program in partnership with the King County Library System and the “Everybody’s Talking about It” Series. Event Sponsors: Humanities WA, King County Library System Downtown Renton Branch, Sustainable Burien, and the Nature Stewards Program.